The ArthroStim is an instrument used by many chiropractors to provide chiropractic relief for specific areas of your body. It is an alternative to traditional chiropractic spinal adjustments, which require twisting, turning, and “cracking” of your body’s joints. Although spinal adjustments are preferable for wide-spread pain throughout your back, neck, and limbs, the ArthroStim allows for more pain relief in targeted areas, which means that you don’t need to endure a full spinal adjustment just to relieve pain and tension in one area of your body. Essentially, with ArthroStim, your individual pains can be treated individually – a preferable alternative to adjusting your entire body needlessly. The ArthroStim is an FDA-approved chiropractic instrument, and it’s been used for 22 years since it was created by IMPAC. ArthroStim is a unique chiropractic instrument in that it is can supplement or replace chiropractic spinal adjustments, providing targeted pain relief treatments in specific areas that need more attention than a spinal adjustment can give, or serving as an independent pain relief technology. There have been ArthroStim improvements over the years to make the ArthroStim instrument more effective and more comfortable for patients and chiropractic doctors. Now, the ArthroStim has been optimized for a variety of treatments and applications, making it an increasingly beneficial chiropractic care instrument. Now that the ArthroStim has been improved and perfected for optimum pain relief, it has numerous benefits for patients as both an independent treatment and a supplemental treatment used in conjunction with spinal adjustments and other chiropractic care services. The benefits of ArthroStim lie in its pain relief capabilities as well as its chiropractic care method. This chiropractic instrument is an effective means of spinal and muscular pain relief in specific areas, which makes this treatment ideal for treating injury-specific pain or pain related to a condition that causes localized pain in one portion of your body or another. The ArthroStim can also provide immediate pain relief, promote relaxation, relieve muscular and nervous tension, and improve patients’ outlook significantly as they see the immediate possibilities of chiropractic pain relief. ArthroStim also has the advantage of allowing for chiropractic treatments where patients are situated in a variety of positions, making identifying and targeting specific areas of tension and pain easier. How Does the ArthroStim Work? The ArthroStim introduces a set amount of energy/force to segments of your body to realignment, remove tension, and relieve nerve pressure and stress. This instrument has been designed to output 12 “taps” per second, or 12 hertz of energy, which provides a low-force but effective means of pain relief and targeted injury treatment. The set amount of energy used in an ArthrStim adjustment allows for a controlled adjustment that feels something like an intensive, targeted electronic massage. With improvements to the ArthroStim, it can now be used for more pain relief treatments than ever before, designed to have an adjustable speed, or various thrusting rates, as well as a customizable thrusting amplitude for use on patients with differing adjustment needs. One of the most useful characteristics of the ArthroStim is its uses on patients in different postures. The benefits of treating patients in a variety of positions cannot be overstated, as it is beneficial for both the patient and our chiropractors. When you’re suffering from localized pain in one segment of your body, you may also be suffering from pain that is only present at certain times. If you feel pain when you stand, walk, stretch, bend, sit, or lie down, the position, frequency, and severity of your pain can give us more information about the best injury treatment plan for you. Knowing when your injury causes you pain is not enough to treat your pain, though, but with targeted ArthroStim adjustments performed when you’re in a position that causes you pain, you can feel the immediate pain relief effects of the ArthroStim, and you can leave our offices confident that your pain relief treatment worked as well as it possibly could. With any pain relief treatment, there can be side effects, and while they are not always comfortable, they are often signs that your treatment is working or that your body is adjusting to the treatment. Although you’ll feel the pain relief benefits of ArthroStim immediately, you’ll also probably find that your body is sore in the areas where the ArthroStim was used, at least for the first day or two after your first adjustment. For many, this soreness simply feels like you’ve been using your muscles for an intensive workout, and they simply need rest to recuperate. The best way to deal with side effects of ArthroStim adjustments is to give in to your body’s needs, rest, and allow your body to relax so that you can feel the benefits of your ArthroStim treatment sooner rather than later. 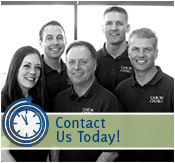 For more information about the ArthroStim instrument or ArthroStim adjustments, contact Caron Chiropractic at 651-255-9999.